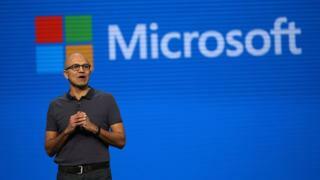 Microsoft is to cut "thousands" of jobs worldwide as it attempts to beef up its presence in the cloud computing sector. The technology giant wants to strengthen its cloud computing division but is facing intense competition from rivals such as Amazon and Google. The cuts are expected to hit the sales team hardest as Microsoft puts more emphasis on selling cloud services. The majority of cuts are expected to be outside the US. The company would not provide additional detail. Microsoft employs about 121,000 people globally, including about 3,000 in the UK. Microsoft UK has a cloud team based in Reading, as well as three data centres around the country. In recent years, the firm has timed major reorganisations to coincide with the end of its financial year in June. Previous layoffs targeted the firm's hardware unit. Cloud computing involves companies storing files and programs in big data centres so they can be accessed anywhere, not just on individual computers. Microsoft wants to target its sales operations better in an effort to attract businesses looking to shift storage and other parts of their businesses online to the cloud. Microsoft said it had notified some employees that their positions will be "eliminated". "Microsoft is implementing changes to better serve our customers and partners," it said in a statement. "Like all companies, we evaluate our business on a regular basis. This can result in increased investment in some places and, from time-to-time, re-deployment in others." Chief executive Satya Nadella has been focusing on the firm's cloud unit, which has been a source of strength for Microsoft. The firm said its "intelligent cloud" products generated $1.7bn (£1.3bn) in revenue for the nine months to the end of March, driven by doubling revenue from its cloud computing platform Azure. However, Microsoft is still lagging a long way behind Amazon Web Services in the sector.